Hanno and Sirus are intent on helping to move these weaner piglets. These piglets were born out in the nurseries of the south field. 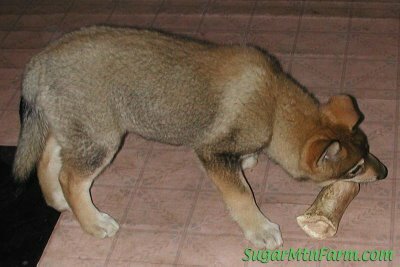 Now at about six weeks of age it is time to wean them off of their mothers who are getting tired of nursing them. The sows start to lay on their teats to prevent the piglets from nursing. The problem is the ladies can’t stand up to go pee, eat or otherwise take care of business without being mobbed by hungry little mouths. Time to wean. Winter months can be brutal. Winter is something to be survived. Or not. The cold months are the times when crop farmers spend planning for the golden months to of spring through fall to come. Livestock farmers are stressed if they’re breeders or other wise carrying animals across the cold months. What was once easy liquids and soft soil becomes hard like iron. In more southern climes they deal with months on end of mud season. Avoid farming in the cold if you can. Winter is brutal. To supply our customers year round with weekly deliveries we had to develop many techniques for dealing with winter when pastures may be under four feet of packed snow and ice. We keep summer rolled up in bales of forage. We stock pile dirt for the minerals. We time our sow’s weanings to encourage their next farrowings to be during the easier periods of weather. With a lot of planning and a little luck it works. Or maybe its the other way around. This week we rotated pigs. No, not on a spit for a BBQ. Rather we were spinning tens of thousands of pounds of live pork around the farm, moving them from one to the next winter paddock. 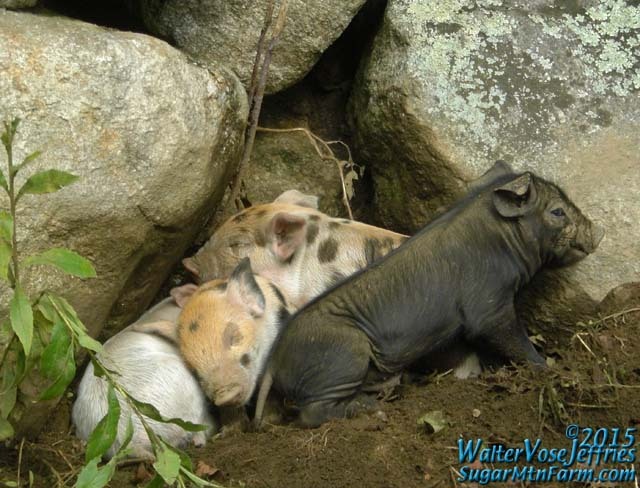 As piglets age they become weaners and move in large groups to new areas. In this case the South Field Courtyard piglets became the mid-level hoop house weaners. Meanwhile north field shoats had grown and they moved down the mountain to become garden growers. Growers became house end roasters. What used to be the roaster group shifted south to become the front hoop finishers. Select gilts of prime genetic potential were pulled out and moved to the breeding herd or otherwise noted so they could be kept as possible replacement breeders. With all this happening six more sows farrowed and nearly ten more are about to farrow right behind them. The spring flush of life. Generally we try to have some farrowing each week but between their natural clustering and my wishing to avoid the brutal months of January and February we are seeing a large cluster coming at us over the next week or two. Behind that I see another big cluster next month. This is goodness. Daily Spark: Find your niche and sharpen your knife. Boy, have you got your hands full! I remember watching those piglets come as a boy, but the sheer numbers of porcine babies you guys are experiencing? Livestock farmers have to go out in the weather in all climes vs. crop farmers who sit back and wait until the warms winds begin to blow. 1. Right now we do feed self mixed feed (its a barley/wheat/field pea/supplement mix) and we supplement with milk when we have extra. Do you recommend allowing breeding pigs to self-regulate their feed or do you think they can become too big, especially the boar? 2. When you substitute milk for feed as the main part of the diet, about how much milk are you feeding each pig per day (growers, nursing sows and boars). 3. Do you allow your boar to stay on pasture with the sows as they farrow or do you remove them? I have read that when you feed commercial feeds and grains that you should limit them for breeding stock however: We don’t feed that so I can’t comment first hand and I suspect those recommendations are based on livestock that are confined. Our animals are out on pasture. They get the vast majority of their diet from the pasture, in the process they get a lot of exercise. We’ve never had overweight animals so we don’t limit their feed. I suspect that by ‘big’ you mean fat, that is overweight, animals. If they’re getting too many calories and not enough exercise they definitely would get fat. Corn, which is the basis of commercial feeds, is very high in calories. Think of it as candy. The trick when feeding candy is to make it be dessert. Have the animals graze all day so they fill up on the good pasture feeds and then in the evening give them grain if you’re going to feed that. Between getting the exercise on pasture and the timing of the feedings I don’t think you’ll have to worry about fat animals. Watch the animals. Develop a keen eye for them. Are they growing well? Putting on muscle? Or are they getting fat? Jowly? Jiggly? If they’re putting on too much fat then cut the calories back. We free feed pasture/hay and dairy and we don’t use commercial feeds so answering your question of how much milk to substitute is rather difficult. However, there was one brief period during one winter where we only had milk and hay and I measured that the pigs would consume up to about 3.6 gallons of dairy per hundred weight per day, about 0.8 lbs of hay per hundred weight per day and about one quarter gallon of water per hundred weight per day. BUT, before you sharpen your pencil on those numbers too much realize that it is going to vary for other pigs of other ages in other climates with other hay and other dairy. There are really too many variables to make those numbers absolutes. My suggestion is to free feed a foundation diet and make sure they’re getting the basics that they need. 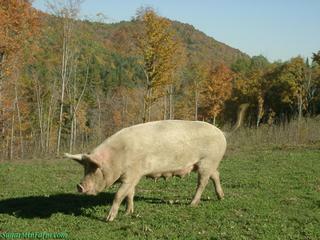 Yes, during the warm months our typically sows farrow in the same pastures as boars. This works because we have many large pastures. The sows seek out the margins, build a nest and defend it. About four to ten days later they bring their piglets back to the herd. The boars are fine with the piglets. During the colder months we separate soon to farrow sows from the herds to give them this same privacy. 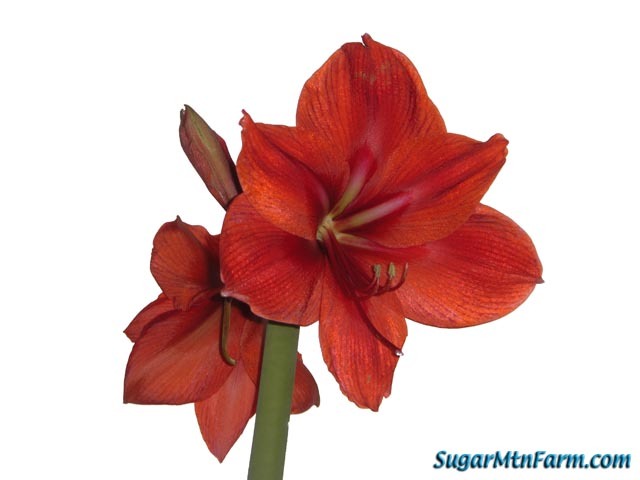 See the posts about the South Field Shed nurseries. If you have boars, or sows, that kill piglets then I suggest making sausage. Cull hard, cull often. Someone told me that pigs can’t eat grass. Please don’t tell that to our pigs. It makes them roll over and laugh too much. There are some people who substitute a sharp pencil on the back of an envelope for actual experience but the reality is pigs can and do eat grass. Also, pasture is not just grass but also consists of many other plants such as clovers, alfalfa, nuts, fruit, etc. 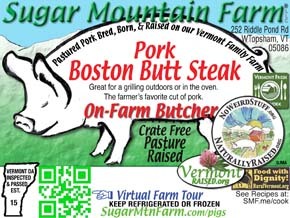 See Pigs Eat Grass, Rootless in Vermont and Sugar Mountain Farm Pigs. 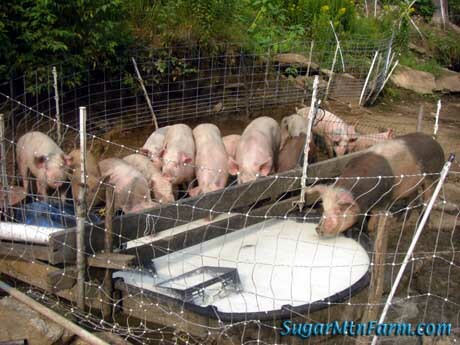 How do you catch the weaner piglets? 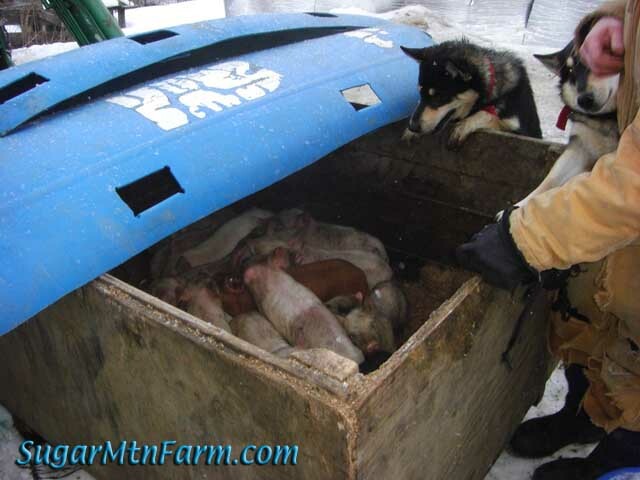 I had such a difficult time catching my last litter and the sow would get angry as well, so I let them stay too long. I know you creep feed, so maybe it is as easy as closing the last door/board and voila, they are separate from their mothers. My sow nearly broke down a building when I tried to separate the piglets. Maybe they were not far enough away? I do not have her anymore. Thank you. How we catch them varies with the situation greatly. You do need to be careful of making them into noise makers or they’ll up set the sow and even the best sow doesn’t like anyone messing with her piglets. Do not get hurt. She’s big and powerful. Ideally sort the sow out to her breakfast in the morning and then sort the piglets into a container such as a carrier box like you see above, quietly herd them up the road with sorting boards or simply lock the sow out of the piglet’s area and move her to a distant location. They do herd quite nicely. Pigs flow like water. It is advisable to have two fences between the newly weaned piglets and drying up sow and the fences should be electrified. A visual barrier helps. Keeping the piglet’s satiated with food and calm so they don’t call helps. 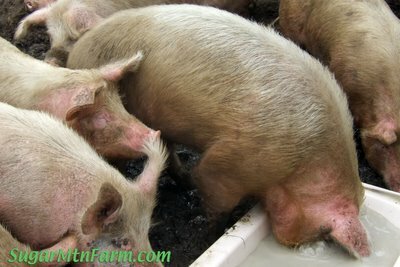 My sows and boars will get too big and fat if I feed more than five pounds per day of my corn/soy/mineral mix. If I didn’t limit them, they would probably eat double that in a day. Walter– I’d love to hear more about feeding dirt to the pigs. We have sheep and I’ve always wondered what people did 100 years ago before there were sheep mineral mixes. I thought all the soil in Vermont/ the northeast was selenium deficient? Have you tried to feed dirt to your sheep? I was about to go buy some expensive clay- based supplement from California– but now I’m thinking that maybe local clay would be just as good. Did you get your soil tested for selenium and other mineral content? thanks so much for your time. I’m a big fan of your meat! 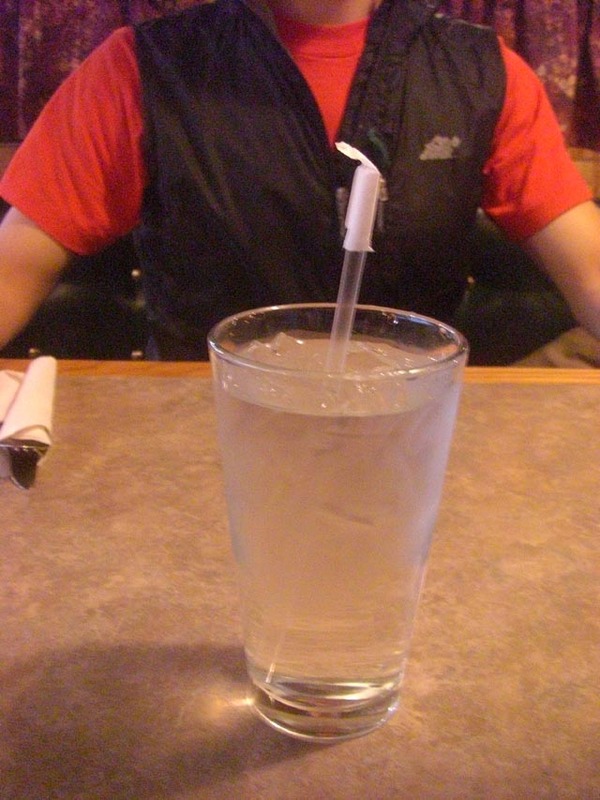 Most soils in Vermont are deficient in selenium but it is more of a problem in the valleys. We’re high up and the source of the selenium here in the mountains. It comes out of the weathering rock. We have both had soil tests and I’ve observed plant and animal growth that are selenium dependent which have backed this up. We had sheep for years and they did fine without mineral additives and they did fine with – I had briefly given them a mineral block at the end of the period we had them (10 years? 4 generations?). The mineral block didn’t appear to change anything. 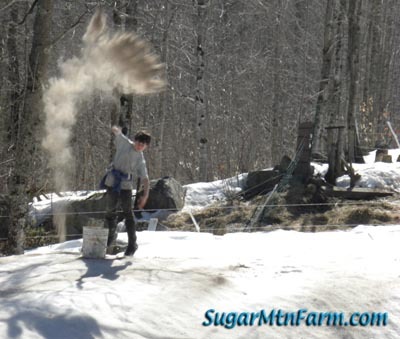 For us winter is the critical time for mineral availability because we spend as long as six months up off the dirt on packed snow. During that time our pasture comes from down in the valley in the form of hay that was grown on selenium deficient soils. For years I have supplemented with dirt from our land. Each time I pickup a bunch of round bales from their storage I use the backhoe to grab a scoop of dirt for the various herds of pigs. When I drop it in they go ga-ga for it. I have read a lot about using ocean kelp and this year I bought a little to try. I seems helpful – that is it can be used as a replacement for the dirt I feed. The kelp also has other good things in it and is certified organic. I got it direct from a Maine harvester. Doesn’t the dirt freeze into a big solid chunk? Are the pigs strong enough to tear apart a block of frozen soil to eat? It is more like crumbles. Melts in the mouth, not on the hooves. Nice description of the process. I had wondered if the pigs stayed in the same field all winter or moved around. this little weaner goes to market, this little weaner stays home . . . lol! My sows are free to roam and have the piglets naturally. Farrow﻿ crates are awful things. Definitely. Glad to hear you’re another free farrowing farmer. Keep up the good ways. I am looking at the possibility of keeping two pigs and have just found your incredibly informative blog. The idea of roatational grazing sounds ideal, but I’m not sure I have enough space to do this especially as I don’t think my 1/4 acre 40′ wide plot is wide enough to do your 9 square tic tac toe method. My 1/4 of an acre plot is long and thin but in an ideal world I want to keep 2 pigs (buying weaners in Spring and butchering in the Fall) and a few hens for eggs. The following year I would then want to use some of the nicely manured land the animals have been on to then grow vegetables etc for the home (there are only two of us), whilst putting new weaners into the next area. 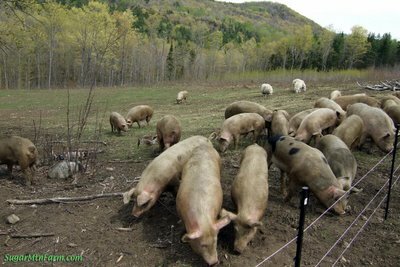 Do you think that 1/4 of an acre will be enough to rotate two pigs and a few hens at the same time as using a little of the land to grow veg? This land will also have to include their housing. A quarter acre is sufficient for two pigs and plenty of space for setting up a managed rotational grazing system and still have some space for a garden. Figure up to ten finisher pigs per acre so about 2.5 per quarter acre. When the pigs are small it will take them longer to eat a section, when they’re bigger they’ll move faster. The advantage of small paddocks is you can leave them in a section for a week when they’re little and then that might just be a day’s area when they are big. Adding eggs to the mix is very good. 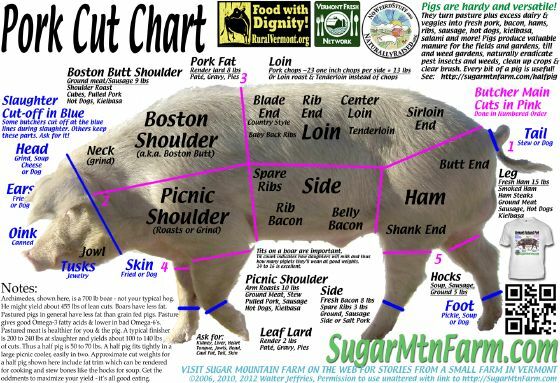 Have you read the post Keeping a Pig for Meat yet? Just got around to reading this post – great info. We are just starting our small erd of pigs, and even with limited numbers the rotations are challenging. We live in NW Georgia, and have lots of clay (and this time of year wet) soil, so we’ve been seeing extensive rooting. This has challenges us daily as we continually adjust our rotations accordingly. Looking at your larger operation and the details involved is overwhelming! If doing them separately I would send in the ruminants first (e.g., sheep, goats, cows) followed by the pigs followed by the poultry. We co-graze. I think our mud seasons in fall and spring are probably about on par with your winter. We use more limited sections of pasture during these season because the animals are harder on the soil. We prefer to not have them on the steeper slopes. In the dead of winter our animals are up off the ground since we get about 4′ of hard snow pack. Even with their walking on it they are 2′ or so above the ground. Then that melts in the spring mud season. Having several paddocks to rotate them through that then become gardens works very well. The first year after the animals have been through the summer garden as winter paddocks I would plant nitrogen loving above ground crops such as broccoli, corn, tomatoes, etc. I wouldn’t plant root crops such as carrots or even ground crops such as lettuce. Then after the gardens have rested a year from the animals they’ll be great for all crops.